Grouping notes together on the guitar helps you remember string areas that don’t connect easily to a common open chord or open string. As you review the note groups, take a few moments to rehearse all the notes in each group, playing through them forward and backward and calling them out as you go. After you have all these natural notes memorized, you can easily fill in the gaps with flats and sharps. To start, take the first three notes on the 5th string: A-B-C. You can play this same group of notes with the same spacing beginning at the 5th fret of the 6th string. Wherever you find an A, B is always a whole step higher, and B and C are always a half step apart. 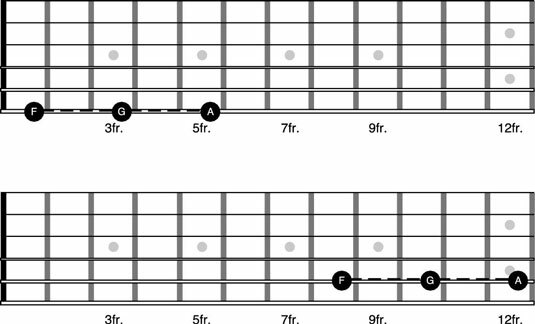 If you memorize these notes on the 5th string between the open position and the 3rd fret, then you also know the notes on the 6th string between the 5th and 8th frets — they’re the same! Similarly, you can group the notes C-D-E. These notes are always separated by whole steps. On the 5th string, they’re at frets 3, 5, and 7, and on the 6th string, they’re at frets 8, 10, and 12. 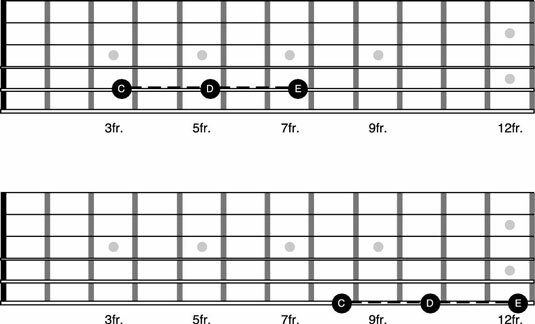 Whenever you’re on a C, you can reach up a whole step to D and another whole step to E. Likewise, whenever you’re on an E, you can reach down a whole step to D and another whole step to C.
You can also group the notes E-F-G on the 6th and 5th strings. On the 6th string, these notes are between the open position and the 3rd fret; on the 5th string, they’re between the 7th and 10th frets. Wherever you find an E, F is always a half step higher, and F and G are always a whole step apart. Finally, you can group the notes F-G-A, which are always separated by whole steps. On the 6th string, they’re at frets 1, 3, and 5; on the 5th string, they’re at frets 8, 10, and 12. Whenever your 1st finger is on F, you can reach up a whole step to G and another whole step to A. Similarly, whenever your 4th finger is on A, you can reach down a whole step to G and another whole step to F.